What Are USPS® Customs Forms? U.S. Postal Service® mail headed to an international destination or sent via Military Mail and weighing more than 16 ounces requires the use of a customs form. 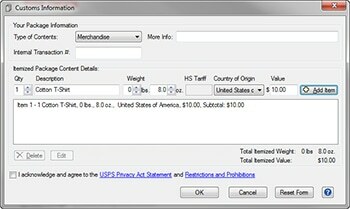 Customs forms summarize the contents of the package and identify the value of the shipped items. These forms make it possible for the destination country to examine mail and allow its entry without having to open and inspect each item one-by-one. The USPS has two different types of customs forms for international mail: PS Form 2976 and PS Form 2976-A. The weight, value, mail class and destination of the package determine which form to use. 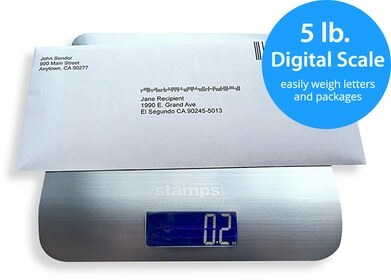 If you are a Stamps.com customer, the software will automatically determine the appropriate form. There are three ways to obtain customs forms. You can pick them up from the Post Office, order them by mail or print them from your computer using an Internet-based postage service such as Stamps.com. Stamps.com makes international shipping easier than ever. With Stamps.com’s automated forms, your staff will never have to hunt for the appropriate customs forms at the Post Office or painstakingly handwrite another customs form ever again. You can fill out all of your needed forms directly through the Stamps.com interface, and then print your postage, address labels and customs forms in one easy step. To complete USPS customs forms using Stamps.com, you’ll be asked to supply some basic information, including whether your package is a commercial sample, gift, document, return or other. You’ll also be asked to specify the quantity of each unique item, along with a description, value, weight, country of origin and HS tariff number (if applicable and known). Stamps.com’s automated customs forms are much easier and faster to use than filling out forms by hand. They also eliminate the confusion of selecting which form to use, since the software automatically generates the appropriate form based on the information you provide. Finally, because you can print both customs form and international postage using Stamps.com, you won’t need to travel to the post office at any point during the shipping process, making your operation much more efficient.